As you can see "Bluety" is quite worn out - the poor old thing. I know absolutely nothing about him and that is why I submitted as much as I could in the ID page in case anyone out there can help. 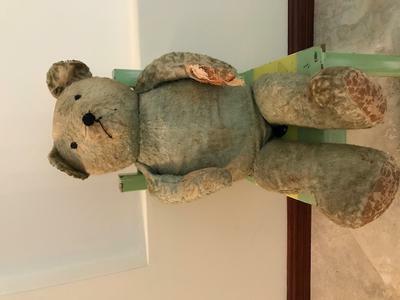 All I can tell you is, that I bought him about 55 years ago at a jumble sale in Chorleywood, England, he is stuffed with straw wood, jointed, used to growl, 76cm long, has lost his face :( and now lives in Australia. Hope you like his picture - to me he is very handsome. He is very handsome. A well loved bear. Join in and write your own page! It's easy to do. How? Simply click here to return to Blue Teddy Bear Pictures.